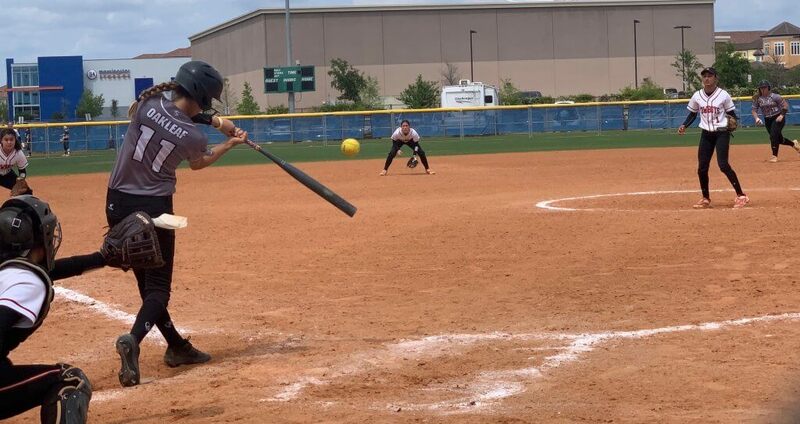 Madisyn Davis of Oakleaf at the plate against Cooper City in the semis of the Blue Bracket on Saturday at the 2019 Roger Jones Kissimmee Klassic. Rain and lightning postponed the finale between Oakleaf and Bartow until April 17. It was going to be a great finale in the Gold Bracket as two Top 50 teams in the Extra Elite Eighty High School Rankings were set to face off Saturday night. Oakleaf (Florida) High, led by pitcher Madisyn Davis, was looking to be a three-time champion and the Central Florida signee was looking to repeat as the Gold Bracket MVP. Ranked #7 in the Extra Elite Eighty, Oakleaf was set to take on #38 Bartow (Florida), but the game didn’t take place due to bad weather. Mother Nature 1, Kissimmee Klassic 0—at least on this weekend as rain and lightning led to the title game being postponed until April 17 at Oakleaf High.